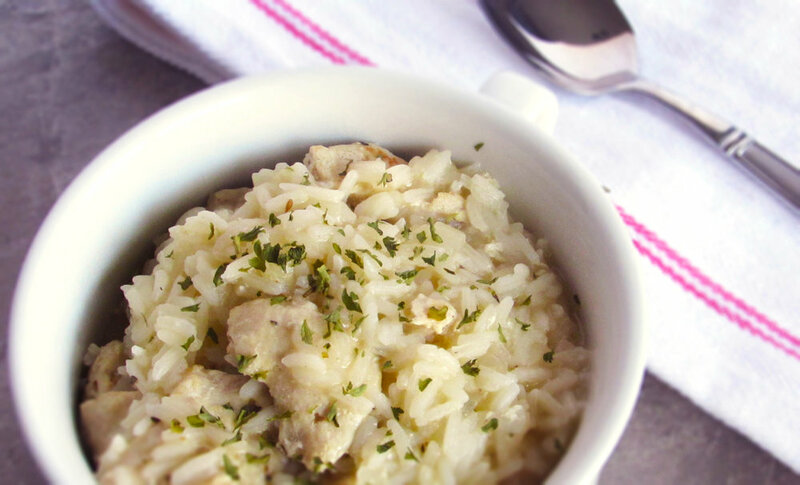 Chicken and rice is classic comfort food. This recipe is very mild with a slight Italian flavor from the dried herbs but you can increase the herbs, add more vegetables or change up the rice to your liking. Adding green beans or asparagus would hold up well with the rice. Using Jasmine or Basmati rice provides a wonderful aroma while cooking! If using brown rice you may need to increase the broth to the higher amount as it absorbs more liquid during cooking and may take a little longer to cook. In a Dutch Oven or large pot with a lid heat the olive oil over medium high heat. Add the chicken and cook for 5-6 minutes, stirring occasionally, until browned. Add the onion and garlic and sauté for 3 minutes. Remove from heat and stir in the parmesan cheese. Sprinkle with the remaining parsley before serving. Modifications: Add more herbs or fresh herbs. Add vegetables such as green beans, asparagus, squash or mushrooms. Click here for printable recipes.